Record of my hang gliding flying experiences. Well, tax day this year is actually April 18 instead of 15, but I got mine done three weeks ago, so the 15th was a great day to take my "new" Falcon 3 back to Taylor. After totally overdoing it last Sunday I took it easy and only flew once, but it was good to be in the air. Winds were much more polite than last weekend, so easier to pick launch moments for all of us. John M. was there with three students: Ricky on his Falcon 4, Noah on his Mark IV, and Andy on one of John's Falcon 2 trainers. Matt I .was there with girlfriend, for a few training hill tandems. Andy C. from Fredericksburg brought out his brand new PG for his first kiting day with it. Pretty cool green, yellow, and red colors; as he said very African. The forecast looked like a nice SW day, perfect for Taylor. Instead, we got one of the switchiest days I recall there. Lots of hang waiting as we watched the winds go up, go down, go left, go right. We did fly, though. John had three students: Andrew on a Condor, Eric on his Falcon 4, and Igor on his Horizon. Stefan was there with his PG. I got in three flights on a new (to me) Falcon 3. The Pulse is now retired and en route to KHK, hoping to become an instructor's dune glider. I need to get my sea legs back; those carries back up the hill wore me out! It will get better. Return to the Mountains, finally! 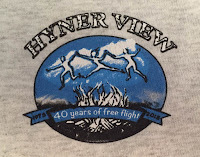 Independence Day Weekend is always a big Hyner View Hang Gliding Club party. I've been able to take part for several years, but last year got skunked on actually flying. Given recent life schedule changes, my last high flight had been at the Hyner party in 2014. Although I've made it to the training hill since then, two years is way too long to go without getting high. Happily, the dry spell was broken on Saturday with a late-day sled. I made my first right-turn approach at Hyner, a rare occurrence there. No fancy enhancements on the video this time. I apologize for the vertical video; apparently my helmet knocked the GoPro mount a bit as I was carrying the glider down to launch. After a weekend off due to shaky weather, I was back at Taylor on Saturday the 19th joining John M. and his five students for a great weather day on the training hill. Thanks to John for letting me know he would be there. Two of the students are Blue Sky truck tow students, working on foot launch skills with John. A third was Mike C, back in the States after a five year hiatus in Indonesia where his wife was posted with AID. Great to have Mike back. I arrived late, so only got in three flights. My first landing was a fast ground skimmer ending in an impressive pop-up to point no-stepper. I have to admit the next two were not so fine, but they were safe. Here'a a tip - buy gas in Falmouth when going to Taylor. Prices go up in King George to the east. Falmouth had a low of $1.85, half a dollar below my local Springfield prices. The year+ hiatus is finally over! Friday night John M. called to let me know he'd be teaching at Taylor the next day. He recommended an early start, given the summer vacation traffic on I-95. I had my glider on the truck Friday night, and was on the road before 8:00 a.m., arriving at Taylor Farm about 9:10. I set up and waited for John and his students, who started arriving about 10:00. Winds were near perfect much of the day, about 5 mph from S to SW, although we did have a fair amount of easterly cross to wait out. John had three brand new students, Young Lee, Jay, and Perry; two with previous scooter tow lessons, Justin and Lucy; and one aerotow H-2 working on his foot launch skills, Eric. Two other experienced pilots, Jesse and Anthony were out for a bit of launch and landing practice, also. I was able to get in four flights before declaring myself exhausted (it was, after all 90+ degrees). All my launches were adequate, of not spectacular, and all my landings were good to very good, each better than the one before, and none on the wheels. I was happy, tired, and glad I headed out. I'm back! The weekend was to be my return to the sky. 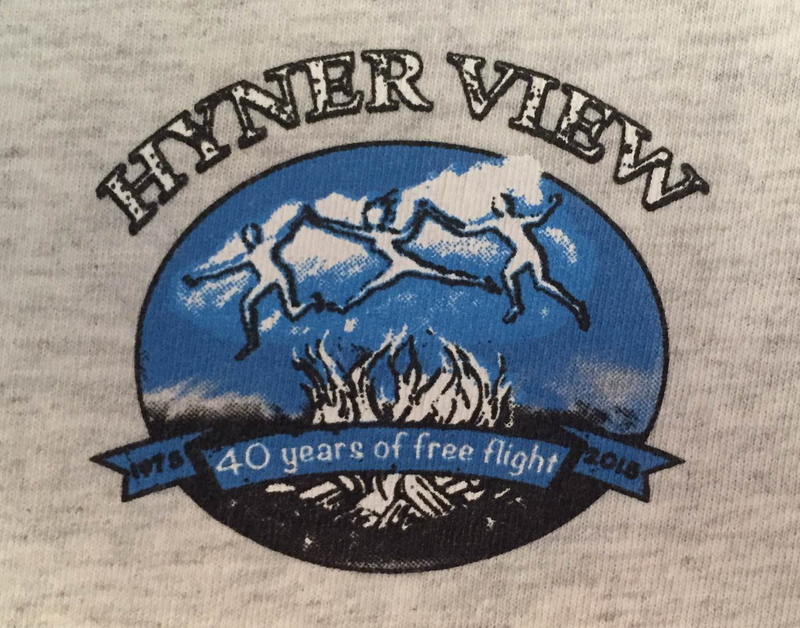 A chance to enjoy the 40th Anniversary Party at Hyner would be a bonus. While I enjoyed the bonus of the party, the basic purpose went unfulfilled. Weather just did not cooperate. I arrived at the LZ campground late Friday afternoon. Got my tent set up, and visited with a number of the folks up and down the row. Drove up to launch to enjoy the view, but did not consider setting up so late in the day. Dinner at The Sportsman with Dennis P. and David & Jodie B. was tasty, with enjoyable conversation and a little HG gossip thrown in. Back in the camp area, I decided that the rain starting about 10 was a good sign for bedtime. The heavy rain pelting the tent was a great soporific sound and I enjoyed the night. The enjoyment faded in the morning, when I discovered that every piece of clothing in the tent had spent the night touching the wall, wicking the rain into each item. Talk about soggy! So, Saturday morning I moved into a room at the Sportsman, drying off there until the sun came out mid-afternoon. Then I was back at the camp site drying clothes and tent in the sun. Again, a late afternoon jaunt to launch convinced me setting up was not on the schedule. A couple of folks did fly very late before sundown. The catered party Saturday night was superb, with plenty of food, a bit of drink, and a well-provisioned raffle. I even won one of the drawings. Late that evening, I understand there was at least one naked fire jumping event, the tradition commemorated on the front of the T-shirts (see above), to demonstrate to a novice camping group what went on "back in the day." Sunday morning I was back at launch, and set up the Pulse for any good opportunity to fly. The wind was light and over the back all day. Some pilots did launch during lulls, but given that my last previous flight was exactly a year ago, I kept waiting for more favorable conditions. Those conditions never happened, so at 4:00 I broke down and headed home. When I left, John M. was reading in a lawn chair next to his glider, still waiting for the right launch winds. I found out later that he, also, never got them. Fine weekend, full of fun, very glad I was there to share in the celebration. Flying will happen again. A four day weekend of camping, camaraderie, and possible flying beckoned me to north central Pennsylvania for the holiday weekend. It had been almost five months since my last flight, 9 months since my last high flight, and over two years since my last mountain launch! I was waaaay overdue. The drive up on Thursday was pleasant, but did include a bit of rain en route. I arrived at the Hyner Club camp ground and landing strip at 5 pm. Within ten minutes thunder approached and the rain began. After dinner in Renovo with Marnie and John, I returned to the camp area and set up my tent about 9:00. Friday the 4th was clear and bright, but wind direction and speed prevented flying. I enjoyed meditating in the sun most of that day. Multiple camping pilots provided fireworks that night, competing with the Renovo community show we could see to the north up the Susquehanna valley. Great fun! Saturday night was friendly campfires, more fireworks, gorgeous night sky we never see in the DC suburbs, and rather novel late night entertainment by BVH. I'm calling his innovation Firecrackin'. The Hyner club is filled with great pilots and friendly people. Thanks to so many for a superb weekend of escape from the daily grind. Shawn, Bob, Joe, Cookie, Karen, John, Steve, Steve, Spoons, Richard, Keith, Brian, Jim, Lloyd, Jason, Don, Doug, Andy, Jonathan, and so many others all deserve my thanks. It was an outstanding weekend. John M called in the morning to let me know he had a couple of students and would be at Taylor Hill for the day. He said I should join them. He was right. I did, loading out my trusty old Pulse. Mark C and David C also brought out their U2 and Eagle, respectively. New (to the area) Ryan not only came out with his Ozone Delta 2 Bag, but was accompanied by lovely spousal driver and three low-mileage groundcrew. Thanks to Ryan for taking a few photos for (of) me, and to his offspring R & A for help they gave me with my glider. It was a beautiful day, even if a bit windy. I got in three nice flights, each culminating in a great landing. I was stoked about those landings. David flew 5 times, Mark did 7, and John even got in a couple, while he let his students take a short break. Mark and I are happy we flew. A victory pose at the bottom of the hill. Mark on the ready, and John on deck. OK, Mark and I were ecstatic we flew! And here you can see Mark, then John, then Mark, again, enjoying the air. Video of me flying iw on Mark's camera; I'll have to work on getting that. More than a year since my last high flight, I headed out to Highland at Ridgely for a day. Tows for everyone were all quite rowdy. I had the roughest tow I have experienced, nearly pinning off at couple hundred feet. Tug pilot Jim Rooney bright the Dragonfly back in front of me, allowing me to stay on tow. Ended up with a sled, and looong final across the entire field. Great to be flying again! I returned to Taylor Farm on Saturday the 8th, once more to join John M. and his students for a day in the sunshine. It was still gray and overcast when we arrived, the grass still damp. However, by early afternoon the sun had come out, the grass dried off, and the wind was a nice mild southwest coming up the hill with a bit of south cross. Jesse Y. was also there, getting in six flights on his Sport 2. John had four students,: Walt, Eric, Trevor, and Curtis. When I arrived, John chided me that he wanted to see me have more than three flights this week. I obliged him by having five flights. My launch runs and landings were both much improved over last week. This week's video starts with John showing the way it's done, followed by two of his students, and finally my fifth and final flight of the day.